"When you entered Manhatten by the Lincoln Tunnel twenty years ago [i.e. in 1960] you saw from the high west bank of the Hudson a vision that lifted your heart and in some measure redeemed the potholes and noise and lunacy and violence of the city. You saw the magic row of transatlantic liners nuzzling the island, their classy, frivolous red and black and white and green uttering their critique of the utility beige-gray of the buildings. In the row might be the Queen Mary or the Queen Elizabeth or the Mauretania, the United States or the America or the Independance, the Rafaello or the Michelangelo or the Liberté. These were the last attendants of the age of travel, soon to fall victim to the jet plane and the cost of oil and the cost of skilled labor." A number of years ago, I was commissioned to make some artwork for a cruise ship. A perk of this commission was that, many months later, when the ship docked in Southampton, the artists who had made work on board were invited to visit the ship while it was docked for the day. The ship was the size of a monstrous slab block of local authority housing, filling the terminal like a luxury hotel combined with a shopping centre. Inside, it gave the impression that it was anything but a sea going vessel, all the while insisting that this was in fact the case by being festooned with the symbols of maritime nature on almost every possible surface available for decoration. This also gave the ship's interior an appearance of, not so much opulence itself, but an idea of the opulence of sea-going travel, available, in reality, to relatively few people decades ago (there was certainly no steerage class on this ship, and travel by large ocean-going vessels is now very much a choice which reflects on those using it). The Baltic ferry from Stockholm to Helsinki taken on the route to St Petersburg felt very much a scaled down version of this, leading one to imagine that in the age of the "jet plane" and the budget airline, travel over the waves is largely an anti-utilitarian simulacra of that idea of a golden age that Paul Fussell was writing about. Before the Channel Tunnel of course, the Channel ferry was the first glimpse of 'abroad' for those leaving England - or perhaps an interstitial space, neither home nor abroad. 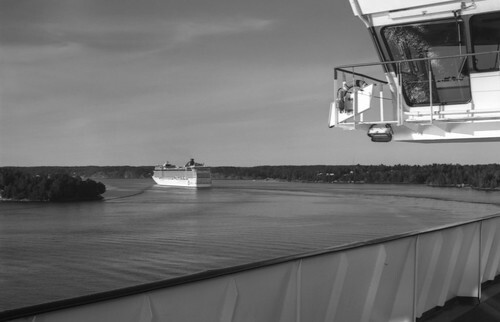 Unlike the huge cruise liner mentioned, or indeed the Baltic ferry, the Channel ferry never quite isolated its passengers from the reality of the means of transport. My earliest crossings to the Continent were by ferry, and, in the first instance, by hovercraft, like the telecommunications towers written about, a symbol of progressive technological advance now firmly stuck in the age when this was seen as symbolic of national pride - a future now gone. Although young, the main memory I have of the hovercraft was the aeroplane-style seating, the idea being that the crossing was to be so rapid that the passengers did not need to get up and move about for the duration. The hovercraft has been discontinued for many years. Later crossings were by more traditional ferry; when travelling to Paris by coach in 1994, I wrote that on the way there, we were not stopped at customs either at Dover or Calais, being waved, or waived, through on the coach itself. The return journey was not as pleasant: a customs official got on to the coach itself at Dover, and, after a student swore at her, we were all made to get off the coach and go through passport control individually. The coach driver, who had spent the duration of our stay in Paris drinking in the bar at the hotel, was rightly sarcastic about this as all the students got back on. Taking the now-discontinued overnight ferry from Harwich to Esbjerg in Denmark some years ago, not knowing how easy it was to go through the boarding procedures, we got a train one hour earlier than needed, just in case, and as a result, had to wait in the tiny International terminal building in Harwich which has precious little facilities to speak of. There were very few foot passengers for the ferry, the security was simple, and one did not feel the weight of the state bearing down on the individual. 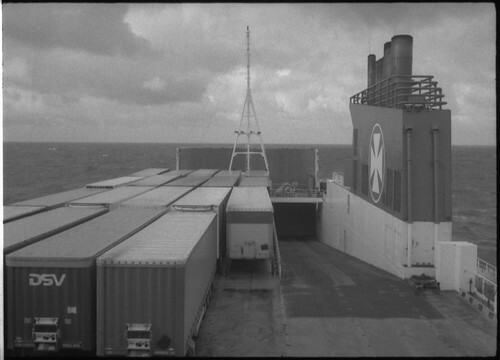 Judging by the small amount of containers on board, the ferry did have some practical use in terms of imports and exports. The resolution to Alice In The Cities occurs on a ferry across the Rhine. Having exhausted all leads in trying to find Alice's grandmother, after discovering that the house in Alice's photograph was now lived in by someone else, Philip decides to take Alice to his parents. At a kiosk beside the road, Philip finds a newspaper with a report in about Alice, but this is not acted upon. On the ferry across the Rhine, Alice asks Philip, "Are you looking forward to seeing your parents?" As the camera concentrates on the woman singing, accompanied by the boy who catches Alice's interest, sufficient to take a Polaroid photograph, we see the policeman that Philip and Alice had encountered in Wuppertal raising his sunglasses as he recognises them. He gets out of his car to approach Philip, saying that Alice's mother had been found. The few scenes that follow - Alice in the policeman's car, with Philip tailing them in his hired car; Alice giving Philip a hundred dollar bill "for your ticket"; and then the two of them on the train to Munich - are all a coda to this resolution of the quest to reunite Alice with her family, while still leaving the protagonists forever in movement, in the final shot of the two looking out of the train window as the aerial shot becomes ever higher and wider, seemingly in the camera's desire to encompass the whole of the Rhine valley.